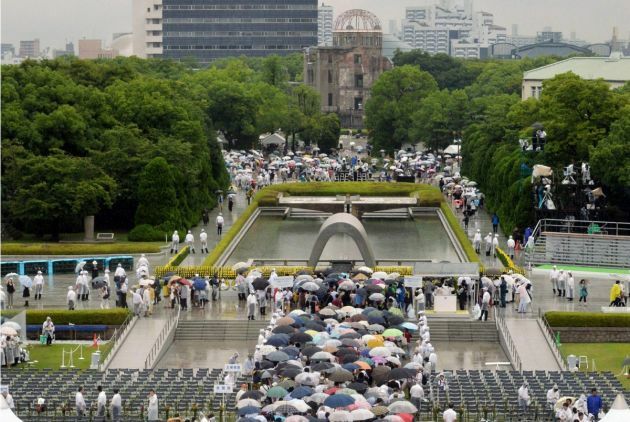 (Photo: REUTERS / Kyodo)People wait in queue to offer prayers for the victims of the 1945 atomic bombing, in the rain at the Peace Memorial Park in Hiroshima, in this photo taken by Kyodo August 6, 2014, on the 69th anniversary of the world's first atomic bombing. President Barack Obama's visit to the Japanese city of Hiroshima comes at a time when signs of peace are sorely needed, World Council of Churches general secretary Rev. Olav Fykse Tveit has said in a letter to the U.S. leader. "We pray that you will be able to talk with the aging survivors of the atomic bombing – the hibakusha – who live to tell their story in the determined hope that no one will ever again suffer their fate," Tveit wrote to Obama noting his May 27 visit to the city in western Japan. "They speak for the hundreds of thousands of people from Japan, Korea and other countries whose lives were shattered by the bombings of Hiroshima and Nagasaki." A U.S. B-29 bomber called the Enola Gay dropped the first atomic ordinance, a uranium bomb, exploding around 600 meter (1,800ft) above the industrial city of Hiroshima at around 08:10 on August 6, 1945 in the final days of the Second World War. Three days later Nagasaki was bombed with a nuclear weapon. Japan surrendered after the nuclear bombings that are believed to have led to the deaths of around 150,000 in Hiroshima and 75,000 in Nagasaki, but were preceded by fire-bombings of all Japanese main cities beforehand. Speaking in Hiroshima Obama said, "The World War that reached its brutal end in Hiroshima and Nagasaki was fought among the wealthiest and most powerful of nations," The Washington Post reported. Obama said, "We must change our mindset about war itself - to prevent conflict through diplomacy, and strive to end conflicts after they've begun; to see our growing interdependence as a cause for peaceful cooperation and not violent competition; to define our nations not by our capacity to destroy, but by what we build.."
Tveit urged Obama to share his vision of a world without nuclear weapons. "The World Council of Churches was founded in 1948, in the shadow of the atomic bombings," Tveit wrote. "We believe that the case for the elimination of nuclear weapons is grounded in the responsibility to protect and care for goodness of all that God has created and for the dignity of all human beings, made in the image of God." Using the energy of the atom in ways that threaten and destroy life is a sinful misuse of the fundamental building blocks of God's creation, Tveit noted in the letter. "Churches in every region of the world refuse to accept that the mass destruction of other peoples can ever be a legitimate means of protecting one's own people."